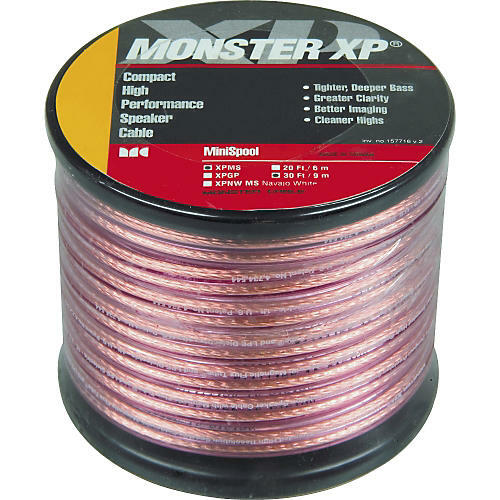 Monster Cable Monster XP Clear Jacket Compact Speaker Cable MKII Mini Spool 30 ft. This Monster XP clear jacket compact speaker cable from Monster Cable features a special Magnetic Flux Tube construction and LPE insulation that lets you hear more of your music, with deeper, tighter bass, better imaging, and powerful dynamic range that easily surpasses ordinary zip cord and many more costly audiophile cables. The special cable windings give you more natural music production, while the insulation reduces signal loss and distortion. This is a 30-foot spool.